It's an enjoyable game but feels all too familiar, the main campaign is not that satisfying especially the ending & only a few of the sidequests offer a new experience. It's a much more reliable release though, I had a few crashes & graphical glitches but much less than the previous games on the 360. I've completed the ending for Brotherhood of Steel & part way through the Railroad ending not sure I can muster the enthusiasm at the moment to see it through, after playing it for quite a bit over the xmas break I need to just step away from gaming at the moment. Overall not bad but certainly not game of the year. I've put in nearly 60+ hours into the game now & barely touched the main questline, I do however have quite a few companions in Codsworth, Dogmeat, Garvey, Piper, Valentine, Strong & Danse. I used Codsworth for a while because I liked his sense of humour, did not get on with Garvey because he was giving me too many new settlement quests & accuracy was poor with his laser rifle. Valentine is good but you can't give him any armour to equip, he will only wear his detective outfit. Strong is a Super Mutant & I've not really used him at all. Danse I hate, in fact the Brotherhood of Steel seem like real twats in this game. I've stuck with Piper for now & given her my combat rifle & old combat armour. Also she seems to be built like a Terminator who can survive explosions. I've moved my home base & all companions to Red Rocket to limit the amount of time I spend on settlements having to deal with settler related issues. I'd rather spend my time exploring the wasteland. I like the way the enemies now flank you but with a high perception & agility my accuracy on the weapon is very good so I very rarely tend to miss any shots. I always use vats to attack, I'm not playing it like a FPS game but an RPG & like decide which part of the enemy to attack. For raiders I tend to go for head & on ghouls legs to slow them down. Settlement building & management can become a bit of chore so I've toned that part of the game down a bit to focus on exploring the wasteland & completing quests. I will do a video shortly showing the two houses I have built in Sanctuary for the settlers & myself. 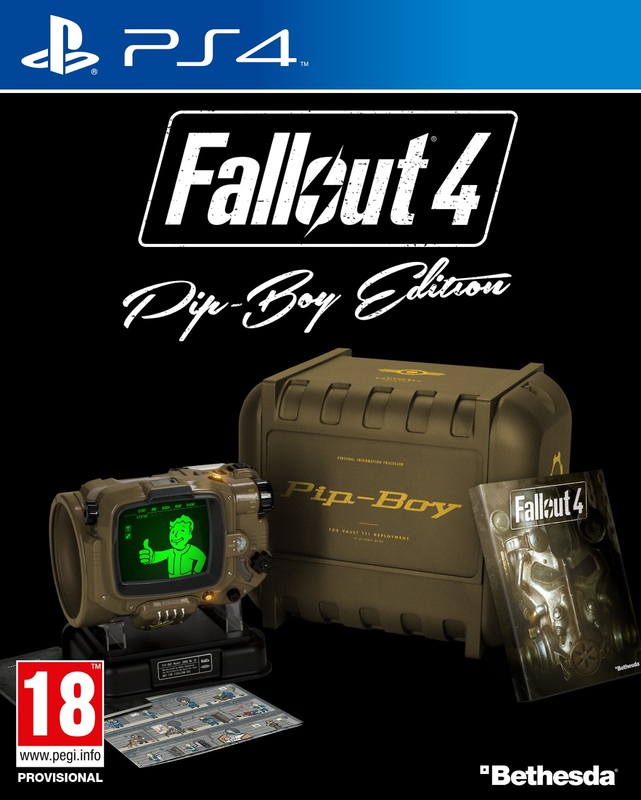 Sorry MGSV will have to wait for now, Fallout 4 feels very familiar to the previous Fallout 3 & New Vegas games which is not a bad thing because I enjoyed both of those games. Some slight refinements in control & level upgrades with the introduction of a minecraft style settlement base building mode are the only changes I have noticed so far. Console sharing with the boys has limited my time in wandering the wasteland, there seems to be a lack of a tutorial so I have been following the in-built help menu & various tips on youtube to figure out base building, not sure if it plays an important part in the game but I have been clearing up Sanctuary Hills & building new homes, power, defences & resource gathering food/water. My character is level 6 at the moment & focused on perception & agility to increase the vats accuracy & ap points. I have gone for the lockpick, hacking & gun nut perks the other points I have spent on upgrading the SPECIAL stats. Will get back on the main quest this weekend & head over to Concord. Will get back to questing this weekend & head over to Concord. 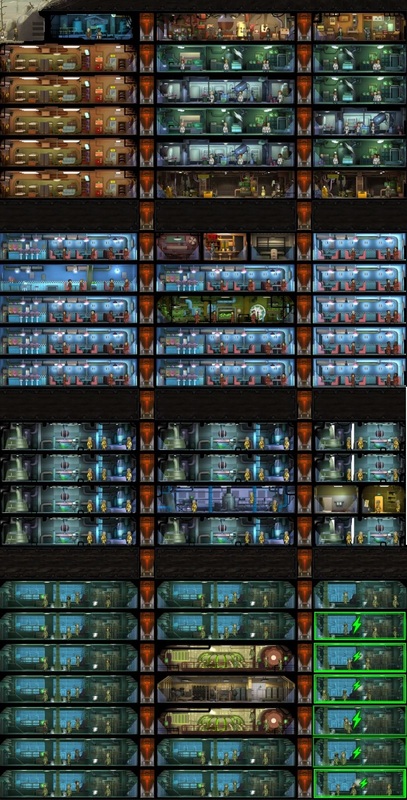 Having reached the 200 dweller limit, I spent some time on moving rooms around the vault & below is a screenshot of my full vault. Just got a bit more charisma training to go on my character before he is fully maxed out on all stats. I've hit the 200 Dwellers vault limit, with not much else to do I'm focussing on levelling up my character to max in all stats & re-organising my vault into sections for electric, food & water production. Hopefully a future update might add more to the game. Still playing but only really spending five minutes in the morning & evening checking in to see how my wasteland wanderers are doing & if I need to recall them back to the vault. 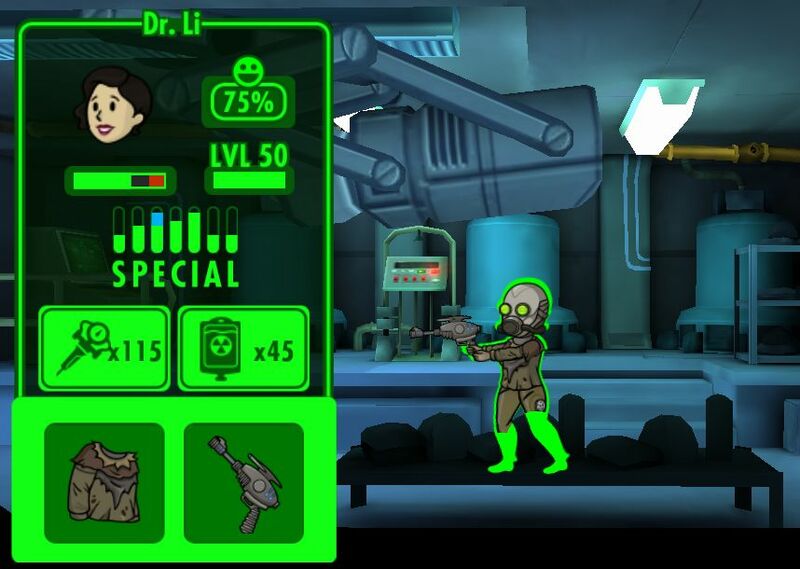 I managed to hit the level cap of 50 with Dr. Li so she is now just looking after the vault door ensuring it is regularly serviced & keeping the raiders away. Finally made it to 100 dwellers & built a Nuka Cola Factory, annoyingly you need high endurance to work in the factory so I have sent off four dwellers to the training room & only have two working in the factory at the moment. Not much else to do now except upgrade the existing rooms & increase the number of dwellers in the vault, game could really do with an update.